Regular Lessons, age 7 and up. On our school horses I offer private lessons and group lessons. Half hour private lessons are recommended for new riders. Learning to groom the horse and tack it up (put on its saddle and bridle) are part of the lesson program. 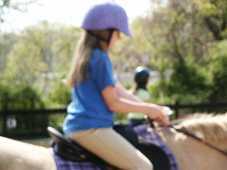 We recommend children to be 7 years old before they start regular riding lessons. Adults are welcome in our program too! We offer another program for little ones called “Pony Pals,” see below. We believe that in training riders and horses skills should be taught in a progressive system. That starts with basic skills and builds confidence. We teach what is considered a “balanced seat” position rather than the “forward seat” or “hunt seat” position because we have found that it is more secure and puts the rider in the best place to communicate with the horse. Whether its trail riding, competing in dressage or lower level eventing, or maybe just owning a horse and learning to care for it properly we hope to be able to help all our students achieve their own personal goals. The pony pal program at Dun-Pikin is very unique. Not many farms will teach riders younger than 7 years of age. We have designed a special program to help prepare younger horse lovers to enter our lesson program. Young aspiring riders (generally age 4 to 6) may enjoy our pony pal program. Riders learn about riding, grooming and general horse care at a very basic level and enjoy a lead-line walk under saddle during the 1/2 session. As their coordination, strength and confidence build many of our pony pals advance to our regular lesson program. Your Pony Pal instructor will monitor your progress. During the lead line ride they learn how to hold the reins and how to sit correctly. This is a great confidence builder and we have found that children that start in the pony pal program have a good confident foundation for riding independently. A few riders have even moved into regular lessons before they turned 7. Lesson rates and session information currently being updated. Call 410-320-3091 for info and to register. Weather policy is being updated. All lesson payments are non-refundable and cannot be used as credits toward camps, parties or other barn activities. Gift certificates are available for lessons. All lesson policies apply. Lessons must be scheduled at least one week in advance and availability of lesson slots will depend on demand and weather. Please be ready to ride at the scheduled time of the lesson. Then plan on staying 15-20 minutes after your lesson to clean your horse and tack before putting away. Horse care is a part of learning to ride and there will usually be a helper in the barn to assist riders. Lesson horses are usually safe to work around, but you must still practice safety around the barn and horses at all times. Horses can bite, kick, move suddenly if frightened and by virtue of their size and strength even hurt you by accidentally bumping into you or stepping on you. Be careful! You must wear proper footwear at all times. This is a boot that covers the ankle and has a heel. Hiking boots are not safe to ride in while in the stirrup, so you need a riding boot. Also use quiet voices and walk when in the barns. When walking or leading the horses always have a lead rope or bridle on him. Please keep plenty of distance between horses in the barn and when riding. Also keep horses tied on cross-ties when tacking and grooming in the barn. 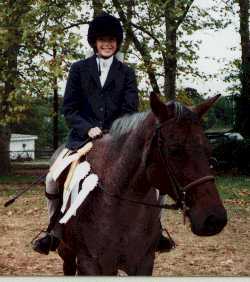 All riders must wear an approved riding helmet when mounted. Remember it is you we are trying to protect with these simple rules. Please be careful! Stay out of the barn aisle while others are tacking up. Do not allow young children to play or roam unsupervised.